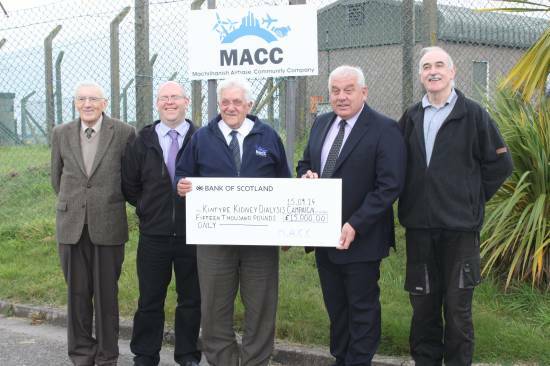 Directors at Machrihanish Airbase Community Company have awarded a generous donation of £15,000 to a local kidney dialysis charity, which has been campaigning for a dialysis unit in Campbeltown Hospital from July this year. Currently, local patients have to make the three and a half hour trip to the Vale of Leven Hospital three times a week for life saving dialysis treatment. This donation will mark the start of a new charitable initiative from MACC where a donation will be awarded on an annual basis to a chosen local charity. MACC are also working closely with Campbeltown Running Club to host an ‘extreme obstacle course’ event which will take place at the airbase on November 29th, with all proceeds going to the dialysis fund. Taking inspiration from the likes of Tough Mudder and Spartan events, the assault course will be four miles long and will feature obstacles that make use of the airbase’s disused assets such as trenches, bunkers and an outdoor shooting range. Entry to the MACC Challenge is now open via www.entrycentral.com.